Take the pass and make the game-winning shot in these women's hockey shoes. 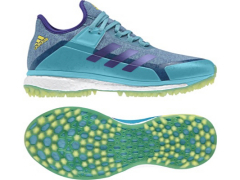 Built with boost for energy-returning cushioning, the shoes have a lightweight textile upper with a sock-like fit. Lugs on the moulded rubber outsole give you great grip as you explode past the defence. BOOST technology combines superb cushioning and energy return throughout the whole game. The midsole shape allows the forefoot to be close to the ground for direct control and to further support the natural running movement. The outsole features a TPU grid structure that is highly resistant, supports multidirectional movements and offers ideal grip. The stretchable inner sock provides the player with an unmatched glove-like fit. Foil-covered synthetic layers deliver additional protection against water as well as impacts from the ball.